A beautiful beach with white powder sand, clean water and excellent swimming. One of Samui's best kept secrets. We accept Amex, Visa, Mastercard, bank transfer and cash (any currency). We do not charge 3.5% fee when using a credit card to pay. Prices valid till end April 2019. Need help ? chat with us now (live chat). The Source Herbal Detox and Wellness Retreat Thailand is a luxury 4 star health and wellness private sanctuary in Lamai, the south east quieter corner of Koh Samui island. It differs from our 'Beach Program' as it is situated inland, not on the beach. 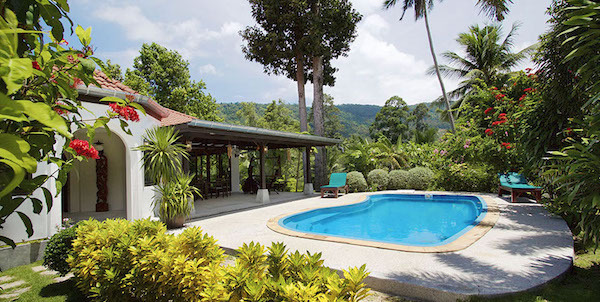 It is a private villa retreat offering a luxury facility with swimming pool and tropical fruit growing gardens where you can relax and rejuvenate enjoying all the natural fruits and fresh juices daily as well as the herbal formulas and therapies provided which are all included in the price. With four private bedrooms, each with it's own private bathroom, housed in two seperate buildings, privacy is assured. Our detox & wellness retreat is located just 5 minutes from The Source Herbal Detox Centre in Lamai yet is located in an area with very little development around it and so it is very quiet, and has good views of the mountains. We accept Amex, Visa, Mastercard, bank transfer and cash (any currency). We do not charge 3.5% fee when using a credit card to pay.